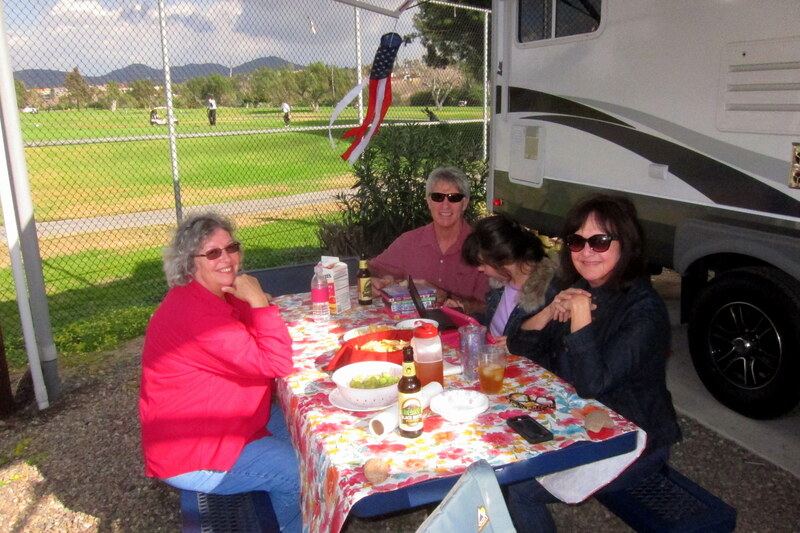 Monday, January 5 through Thursday, January 22, 2015-Santee, California- Part Two: Well, still in Santee and spending a considerable amount of time getting the new camper outfitted to our liking. Kit and I made many trips to Lowes, Home Depot and Bed, Bath and Beyond. Which got my mind to wandering…..beyond what? What could possibly be beyond bed and bath? Maybe stuff for the garage…..Bed, Bath and Garage! Yea, that’s the ticket!! Anyway, all these trips resulted in lots of camper improvement jobs for poor old Bill. In addition to upgrading the towel racks in the bathroom to residential quality, we added a couple of towel rings as well. We then installed shoe caddies in the bedroom, hung some magnetic boards for displaying family photos, installed various shelving in the various closets, cabinets and the kitchen pantry. Then purchased a tiny Dyson cordless vacuum to handle all the carpet we now have and various other items to personalize the camper to our liking…..and like it we do! 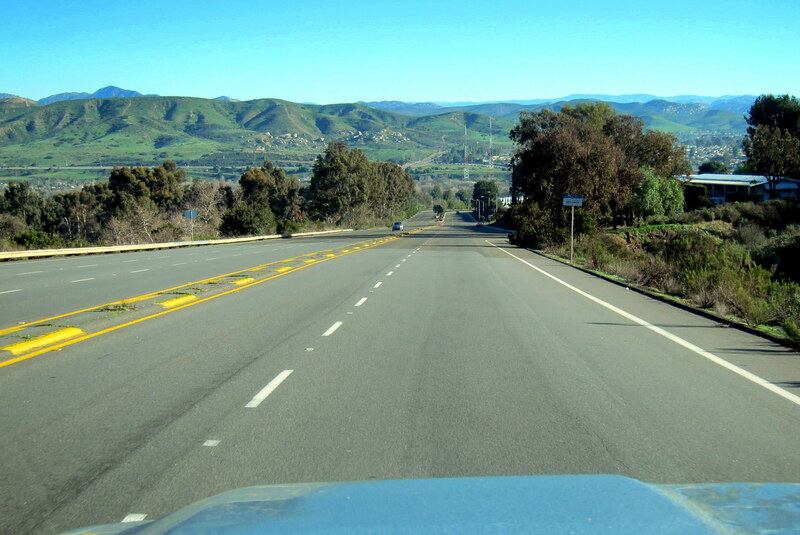 This year’s stop in the San Diego area is turning out to be one of reconnecting. 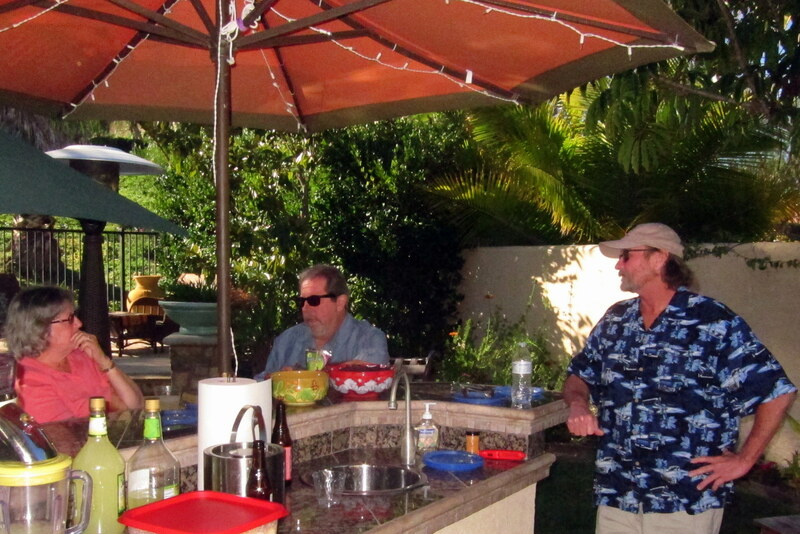 In addition to the great time we had with JoAnne and Ron; we were able to join most of Kit’s remaining family at brother Sam David’s place in Rancho Bernardo for a backyard barbeque. 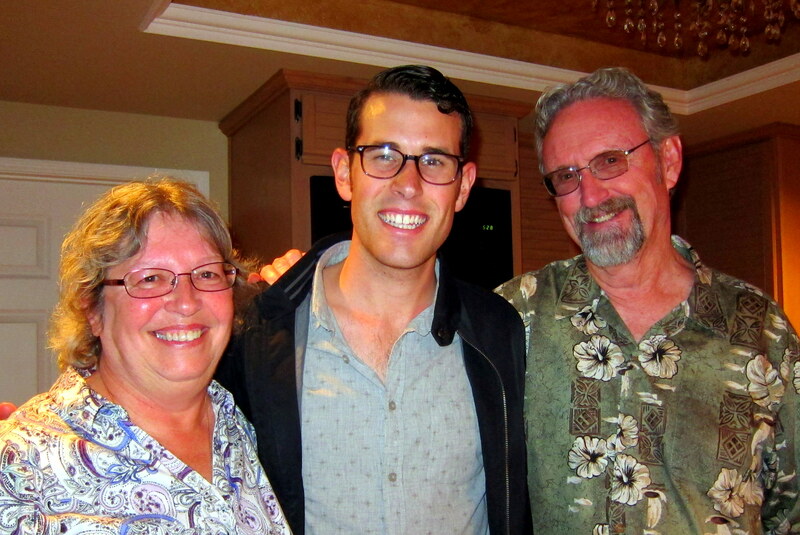 Sam David is a brother, not a “Brother”…..although his barbequing prowess is certainly a religious experience! Kit, John, Char and Sam David haven’t visited in years. As with many families, location, life and interests have gotten in the way of their staying in touch. So this was indeed a grand and joyous reunion! Do I hear a halleluiah? The only one still missing is Kit’s brother Tom, he’s not a “Brother” either…..hopefully at some point he will return to the family fold as well. 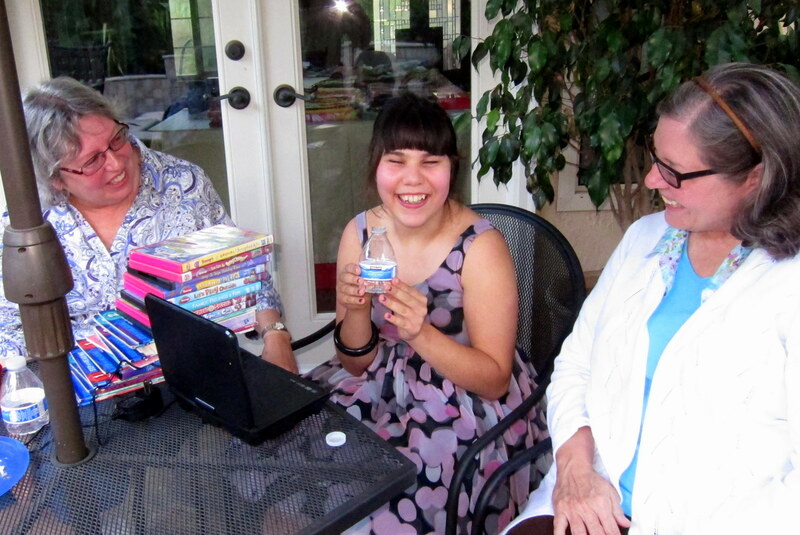 Kit’s family was able to get together a few times during our stay…..one of the premier occasions was the fifteenth birthday party for Kit’s delightful niece, Chelsea. Sam David and Anne’s daughter is a special-needs teen. 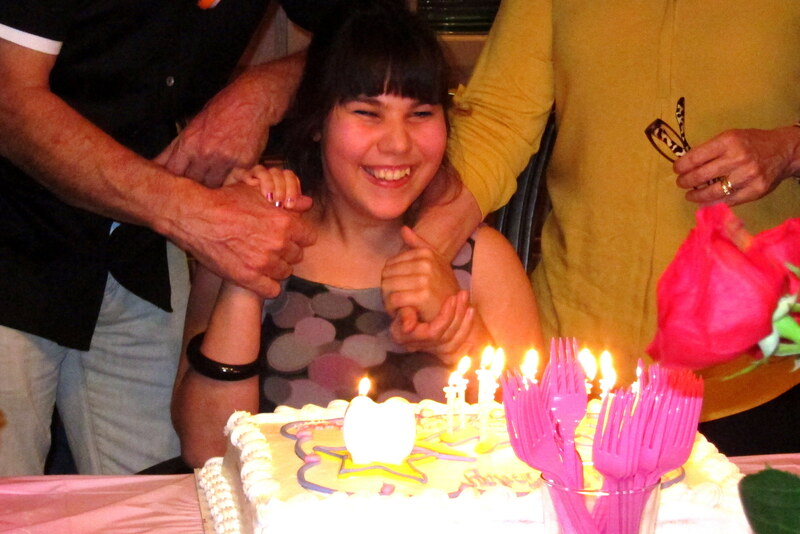 Beautiful and full of life, Chelsea is a very happy and content young lady. Kit and Char adore their niece and spent a considerable amount of time fussing over her. Sam David and Anne have done a wonderful job with Chelsea’s development and keeping her grounded…..what a great family! At the party, Kit and I also enjoyed visiting with folks from Anne’s large family…..especially her father and stepmother. We also enjoyed reconnecting with Sam David’s 25 year old son Matthew. A great kid and talented musician, Matthew’s day job is in real estate…..if you’re looking for property in San Diego he’s your guy! Sam David and Anne have a beautiful backyard where they enjoy entertaining family and friends. The relatively small space has been transformed into a lush and inviting outdoor room. It features a number of terraced decks for private dining, a nice custom swimming pool with a waterfall and a custom built Jacuzzi. 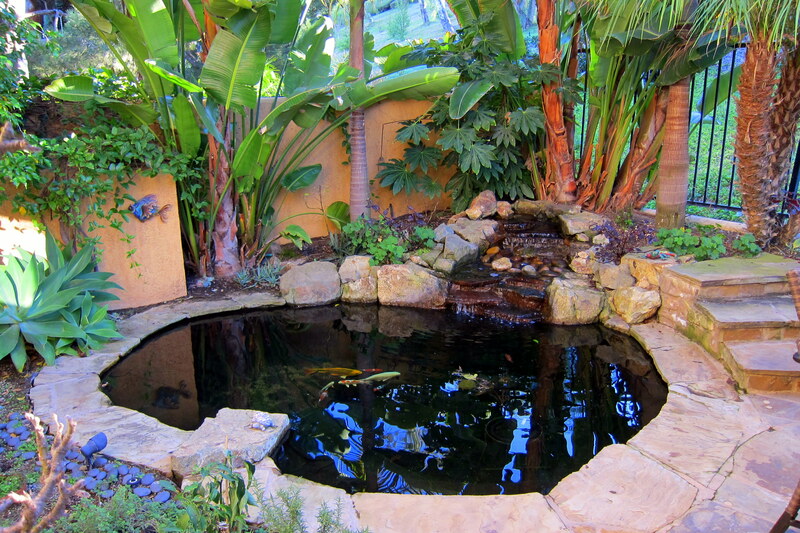 Next to the main dining terrace is a beautiful Koi pond. The soothing sounds of burbling water coupled with the rustling of the palm trees swaying in the gentle breeze made for a very comfortable and relaxing environment. The backyard also features a fully equipped outdoor kitchen where Sam David held court. 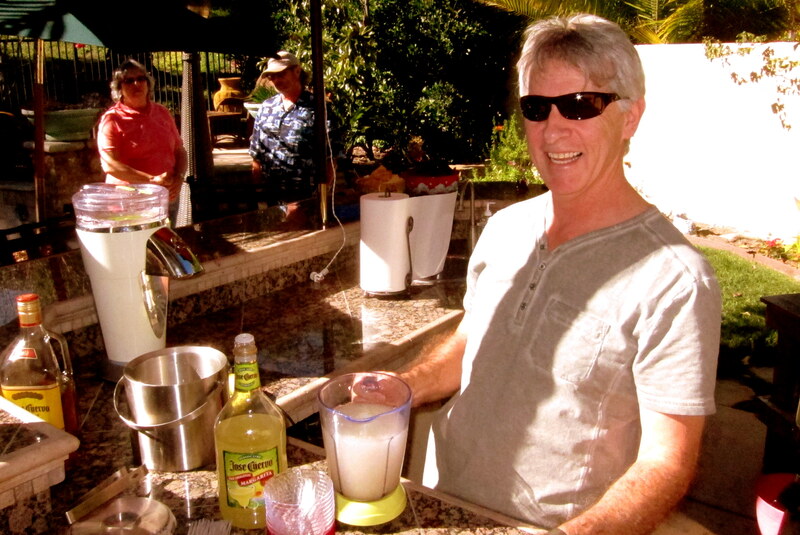 The consummate host, he barbequed the food to perfection and kept the cold beer and drinks coming. 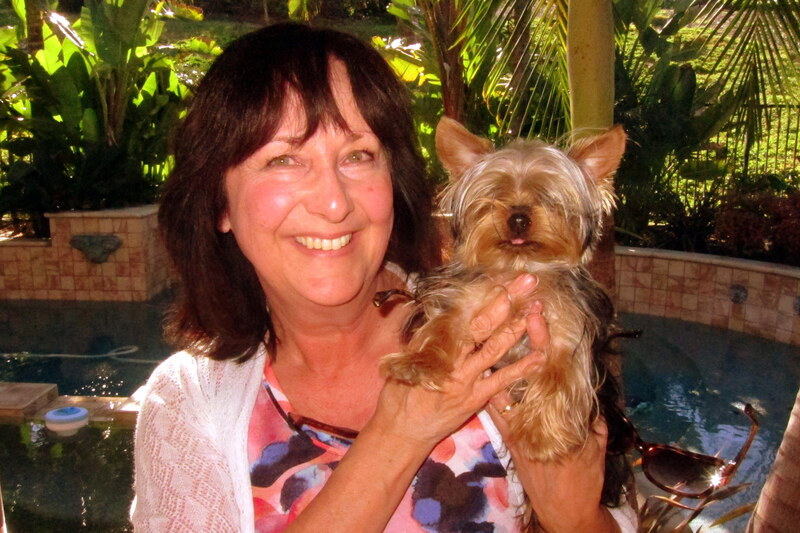 And let’s not leave out Katie, the newest member of the household…..seen below being held by Anne. 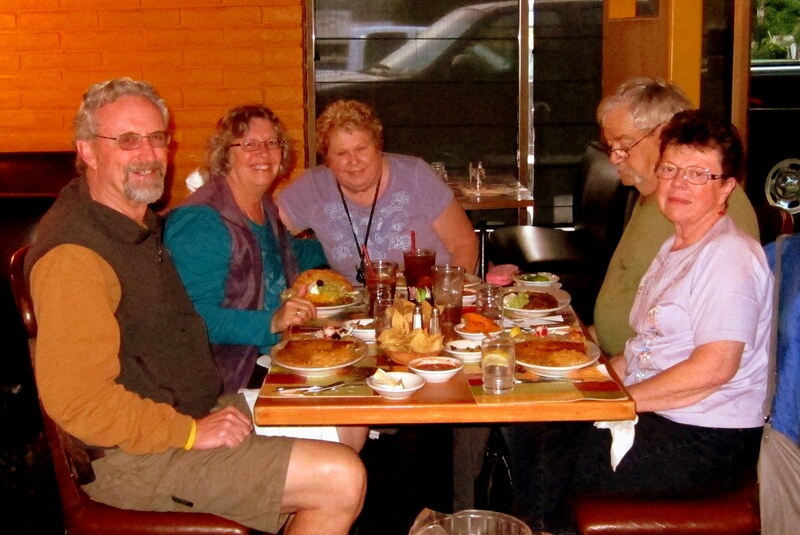 A great time was had by all, and Kit was delighted to spend time with her West coast family. 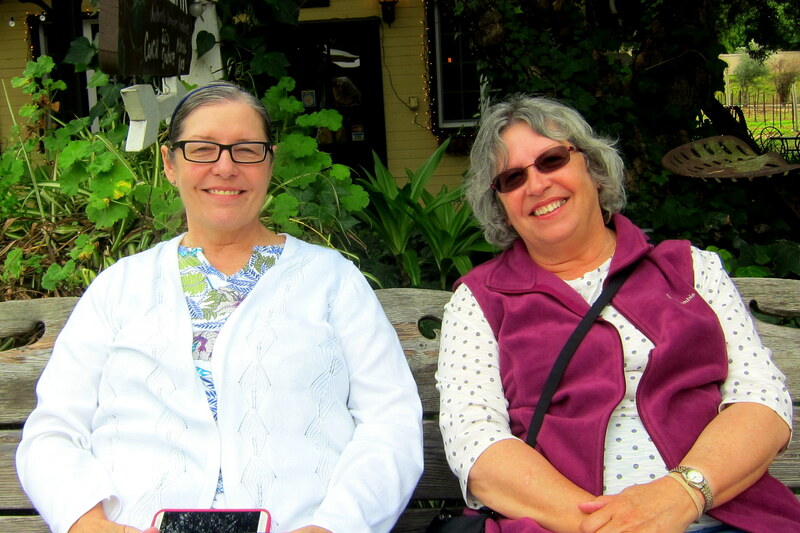 Before we had to move on to our next stop, Kit and I hosted a small gathering at Santee Lakes for JoAnne to reconnect with Kit’s sister Char. Using my Weber grill, I was able to turn some raw meat into edible food while Kit made some very tasty side dishes. It was a nice day with nice folks and everyone appeared to enjoy themselves. 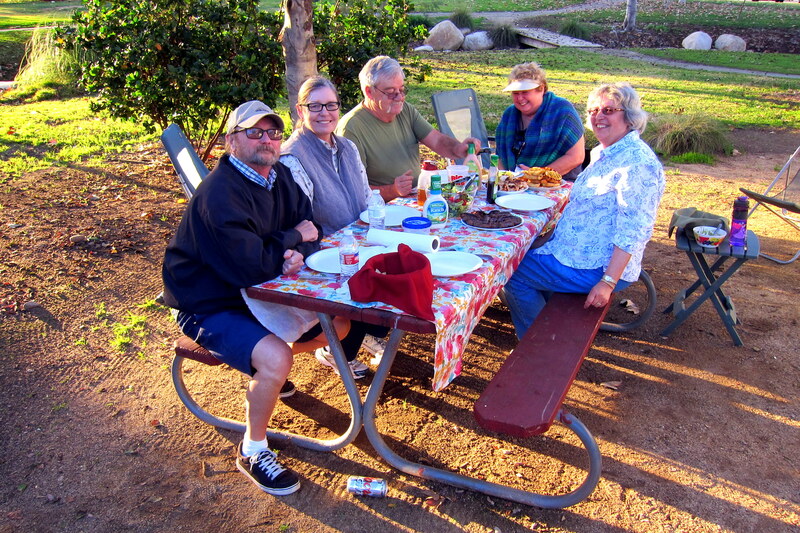 Friday, January 23, 2015: Our stay has come to an end at Santee Lakes Regional Park and Campground. 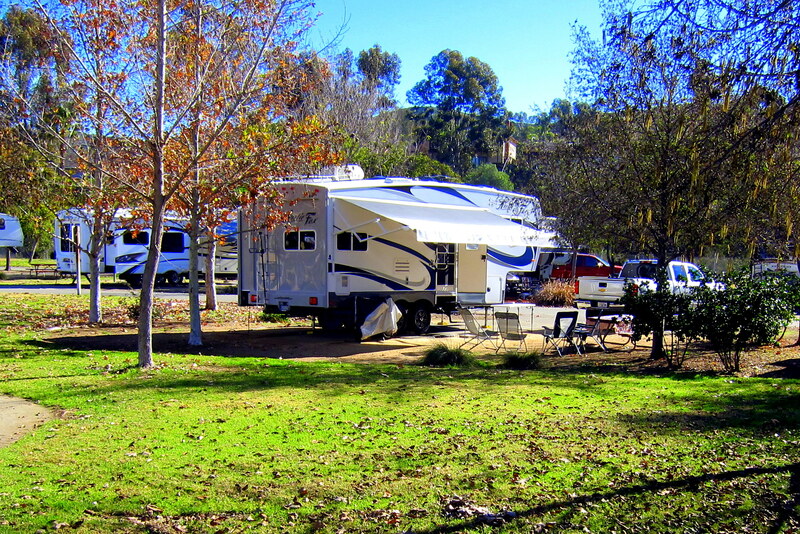 Kit and I are glad we learned of this campground and will list it as one of our favorite campgrounds in San Diego County! However, since we were able to secure a spot at the Navy’s Admiral Baker Field in Mission Valley, we decided to relocate. We have stayed here many times in the past and even though it lacks many of the amenities of Santee Lakes, the site fee is about half the price…..an important factor to a pensioner! 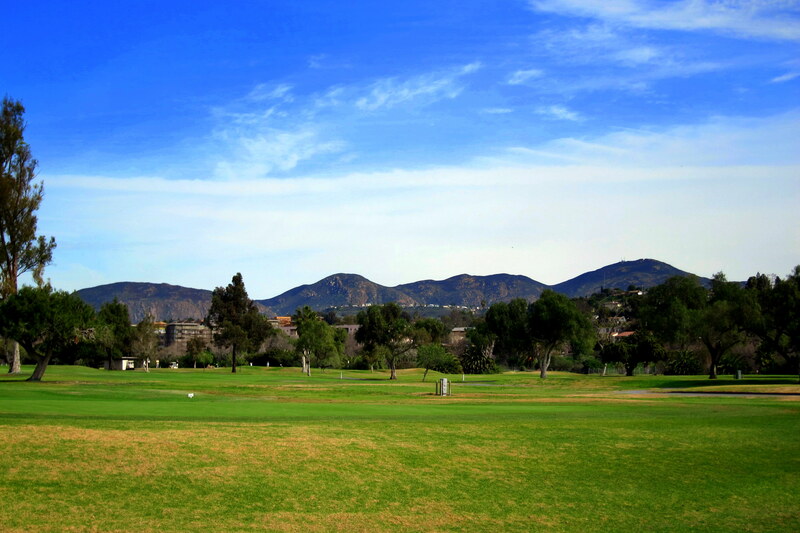 Besides, if one is a golfer, or a kite flyer, there are vast fields to enjoy your sport. Golfers don’t see the need for me to fly high performance kites over their heads and I don’t understand their sport either. So, for now, it’s a draw…..unless someone invents kite-golfing! Saturday, January 24 through Sunday, February 1, 2015-San Diego, California: While here we attended to some business for my mother’s scheduled Military Honors ceremony at Fort Rosecrans National Cemetery. First order of business was a visit to the regional VA facility to acquire an American Flag. 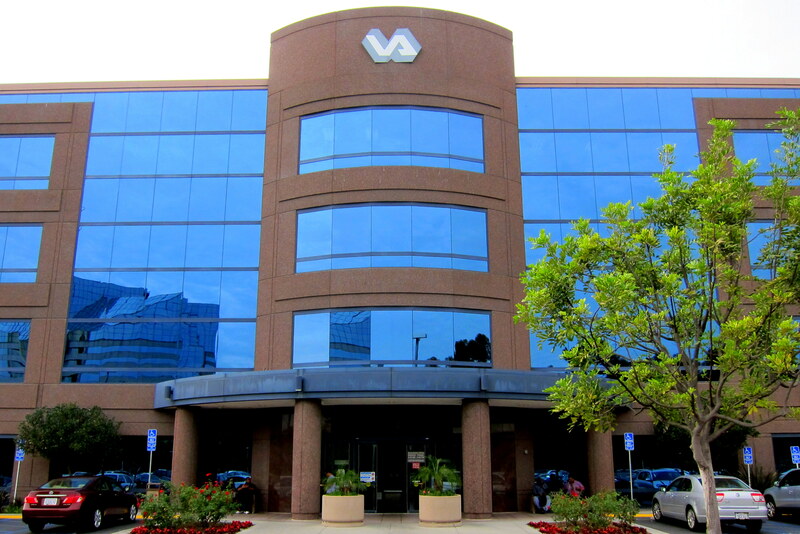 Regardless of all the negative press the VA has been getting, this particular office was modern, clean, and accommodating. The staff we dealt with was very professional and seemed to enjoy helping the veteran with whatever they needed. 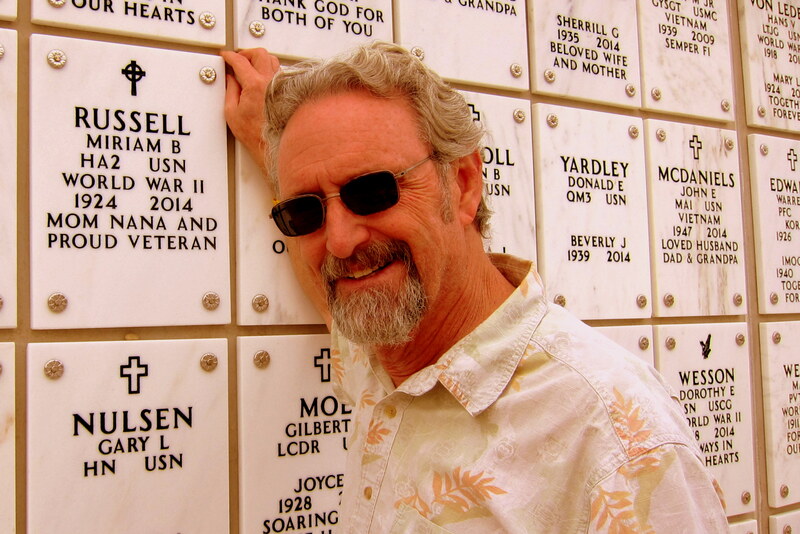 The next stop was to visit mom at Fort Rosecrans National Cemetery on Point Loma. 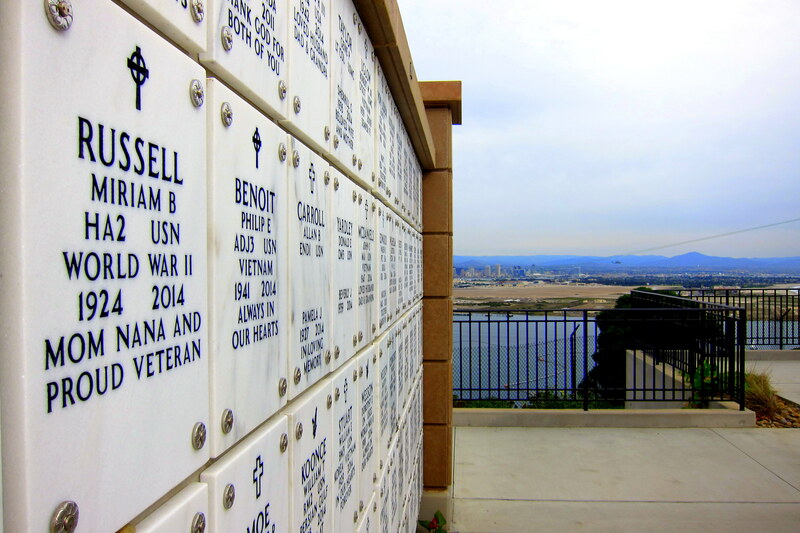 Mom is interned in the Columbarium Wall with a nice view of San Diego Bay and North Island Naval Air Station…..she would be so pleased. After paying our respects Kit and I visited the administration building to coordinate the ceremony scheduled for next month. We then stopped by Liberty Station and arranged the reception for family and guests who may attend the ceremony. 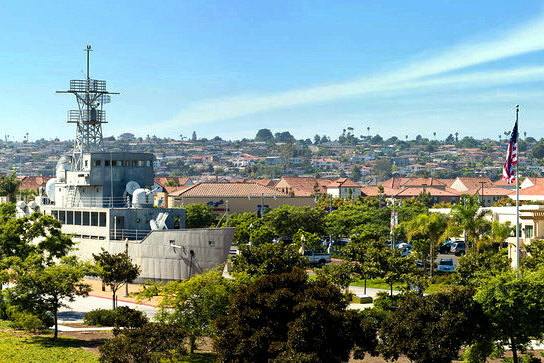 Liberty Station is a commercial, residential and recreational facility built from the remains of the former San Diego Naval Training Center where many of us received Recruit Training. 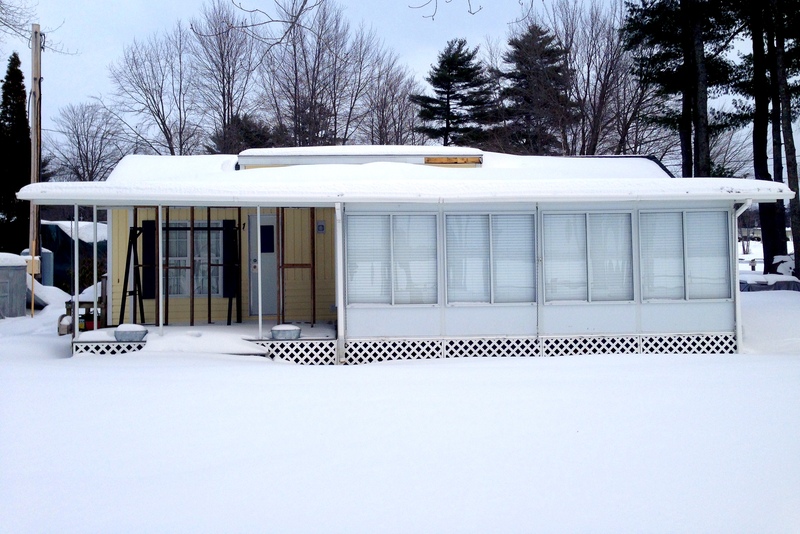 Below is a photo I grabbed off their website that captures the essence of the place. If you served in the Navy and rotated though San Diego, then you likely attended classes onboard the USS Recruit. This historic landlocked symbol of the naval Training Center was built in 1949 as a training g ship and is currently being preserved and developed into a naval museum. Liberty Station is without a doubt, one of the best repurposing of abandoned military property we have ever seen! While at Admiral Baker Field, we arranged to meet JoAnne, Ron and Sherry at their favorite Mexican food place, La Palapa over in Lakeside. 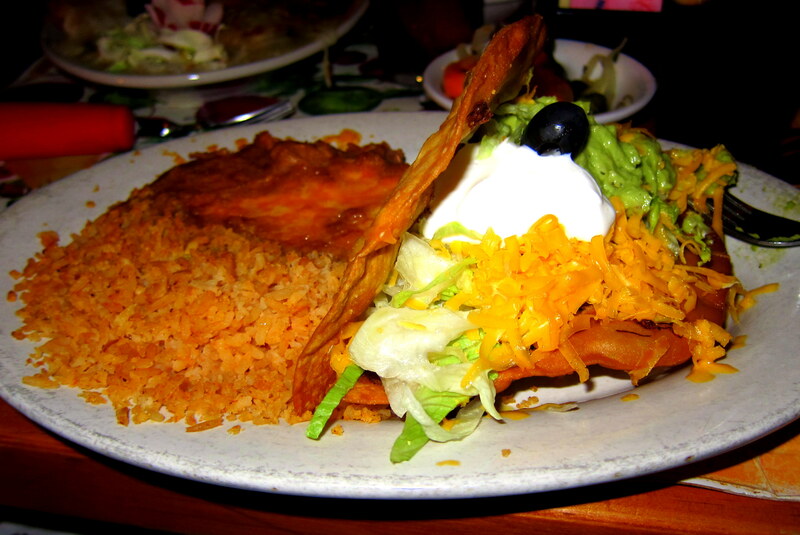 As we have come to expect, the Mexican cuisine in the American Southwest is second only to what one finds in Mexico itself…..in other words, this place had great food and plentiful portions! 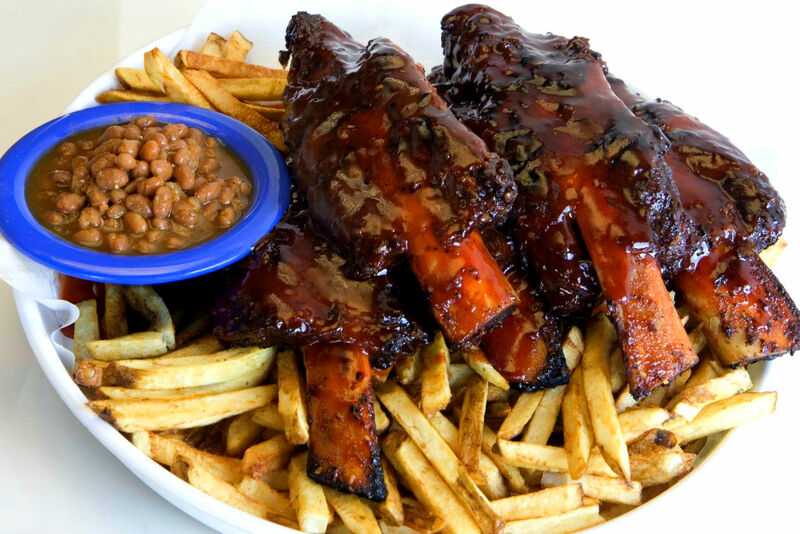 Two other places that JoAnne and Ron introduced us to were Marechiaro’s Italian and one of the best barbeque places around…..Phil’s BBQ. Yep, we did eat out a lot but thoroughly enjoyed being guided to the best food places in Santee by great folks that know the area and great food! 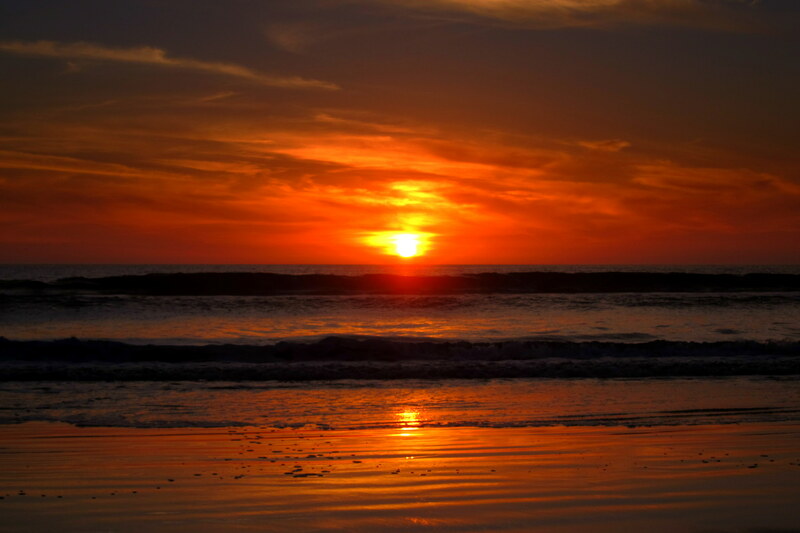 Many people think of San Diego as dead flat since it is along the Pacific coastline. However like many coastal areas, including Maine, this area is anything but flat. The hills and canyons provide a variety of terrain and help break up the various population centers. However even with these impediments the hillsides get developed. 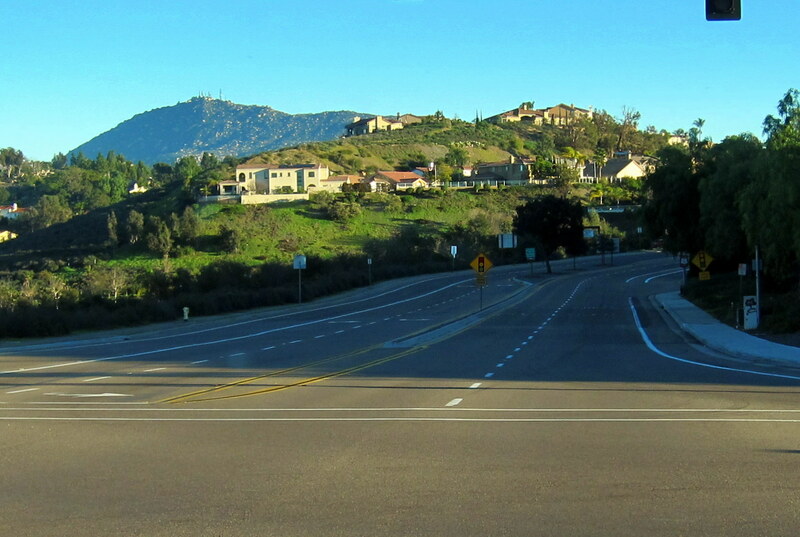 It’s amazing how the local homebuilders eke out a tiny lot on a hillside and build a huge home. While we were basking in the sunshine and 70 degree weather of San Diego, a huge Nor’easter was bearing down on our hometown. 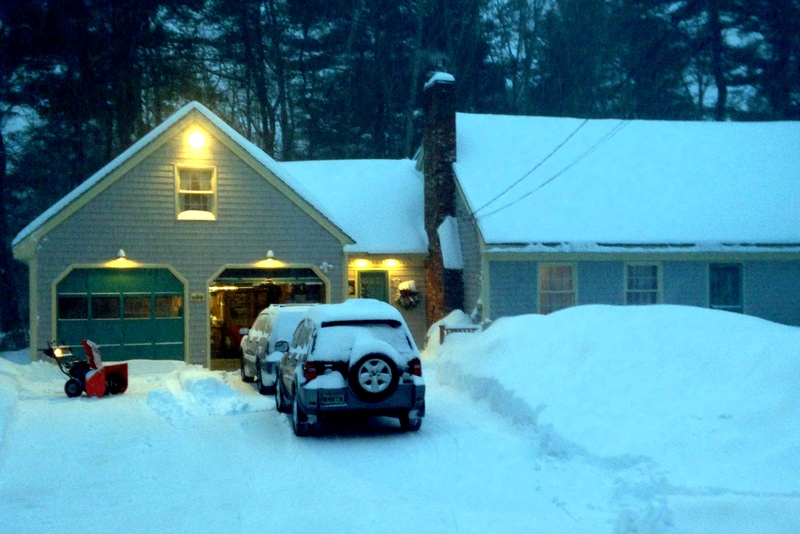 Superstorm Juno hit Maine with a vengeance. 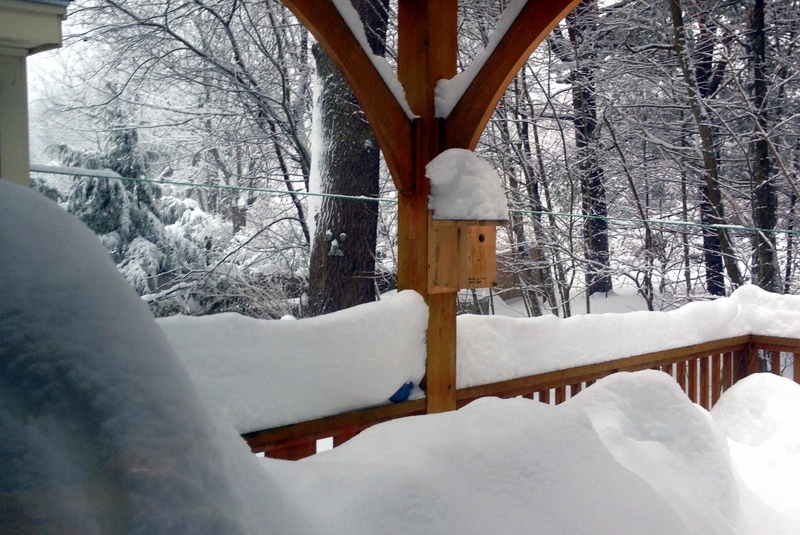 Days later, our Maine family and friends were still dealing with the massive snowfall. 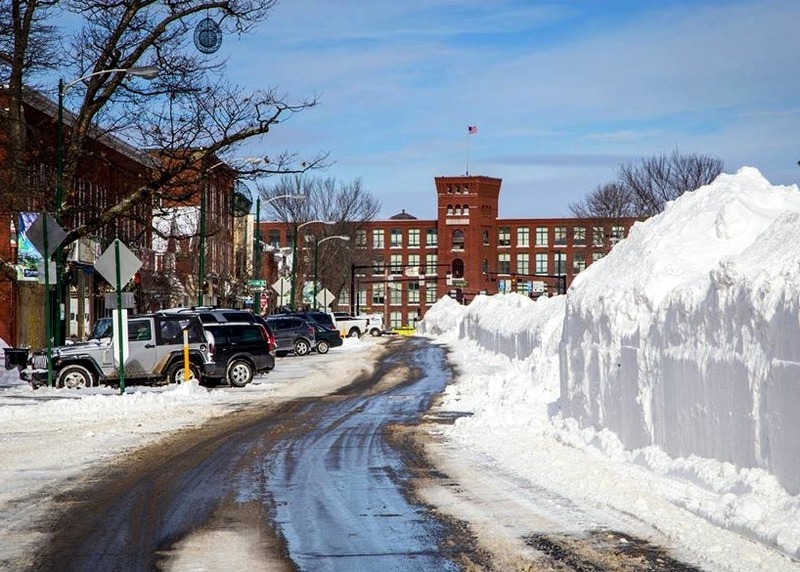 The photo above is a screenshot off the internet and shows the piles of snow remaining on Maine Street. Yep, that’s how our hometown’s main street is spelled…..clever, huh? And our sticks and bricks home was buried as well. Oh, for you folks that live in the Sunbelt, that orange contraption seen on the left is a snow-blower…..powerful enough to fling snow clear to Florida! Grandson Joe has been busy keeping the driveway clear for his mom and Abby. With the winds, the snow drifts were even bigger in our backyard! Also our son Joe had the presence of mind to snowshoe into the family camp and snap a few photos before clearing snow off the roof. The camp now sits in front of Maine’s second largest skating pond! Thanks guys, for taking care of things while we goof off in the sunshine of Southern California! 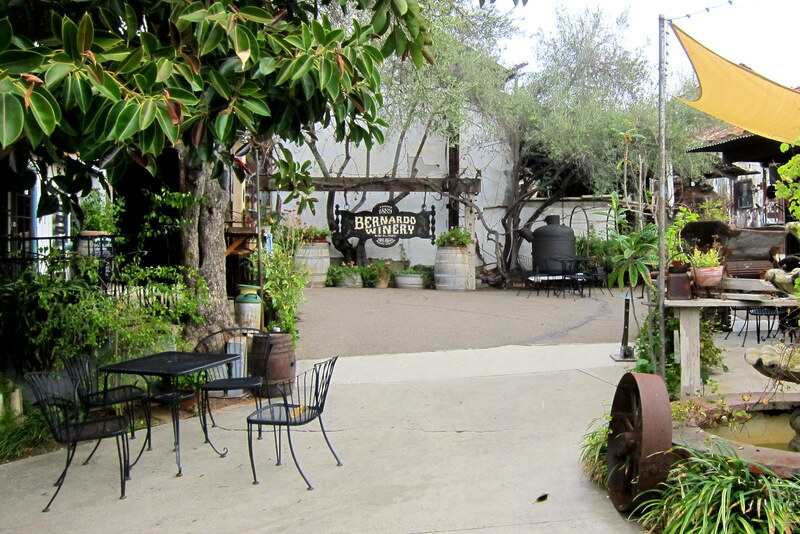 Kit and Char spent a few days together enjoying sights they wanted to see…..one of these was the Bernardo Winery, a stones through from Char’s home. They both reported having a grand time…..at least what they could remember of it! 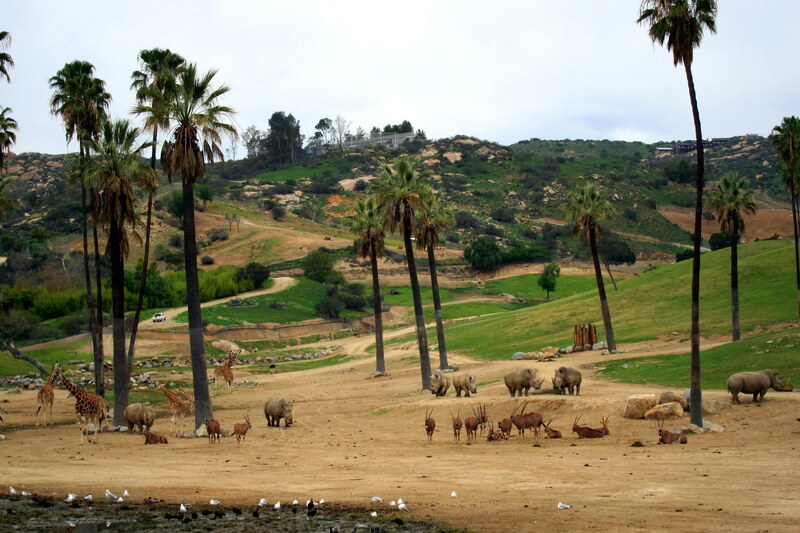 Having a free day, I took the opportunity to visit Safari Park in the San Pasqual Valley which is just a few miles to the north. 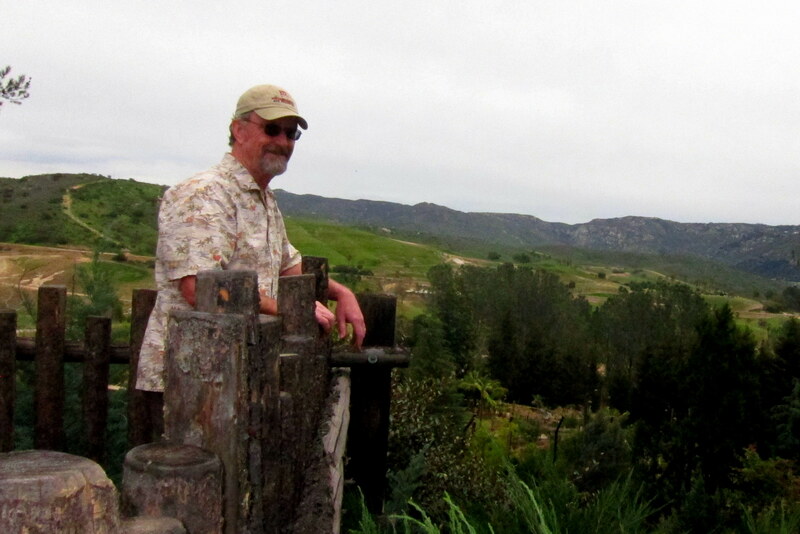 I had not explored this park since 1972; shortly after it had opened…..back then it was known as the San Diego Wild Animal Park. 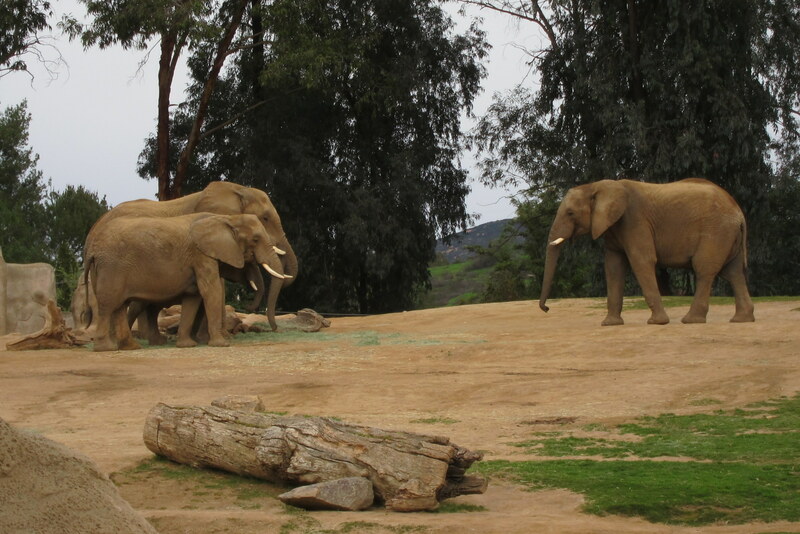 The park is an adjunct of the world famous San Diego Zoo and specializes in the rehabilitation and breeding of the worlds endangered species. 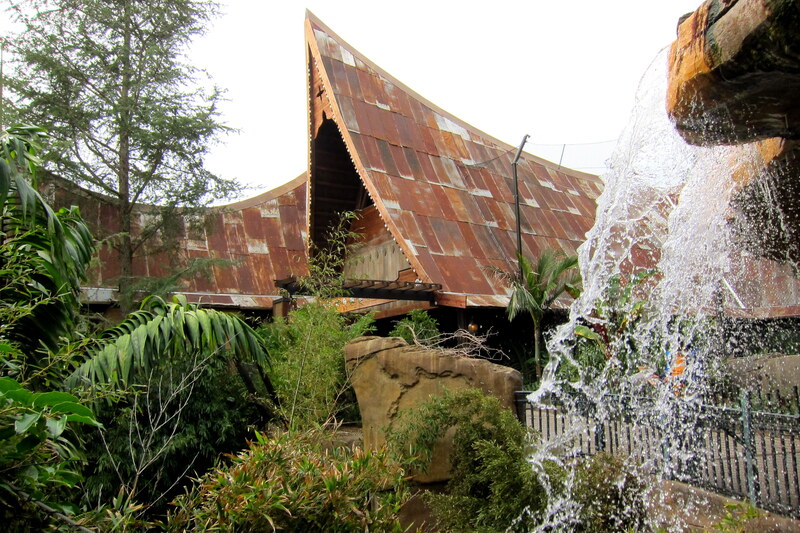 In addition to the attraction itself, the park features the largest veterinary hospital in the world. 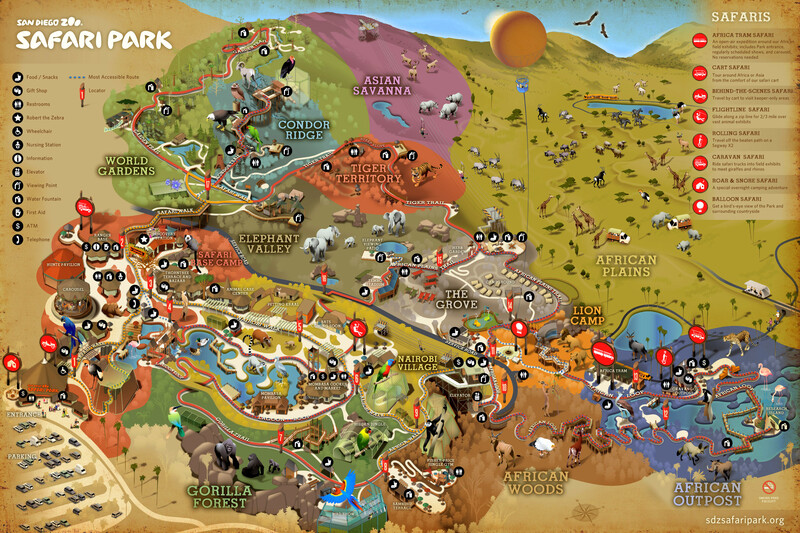 Safari Park is made up of a number of environmental regions, each landscaped to resemble the natural habitat of the animals that inhabit them. 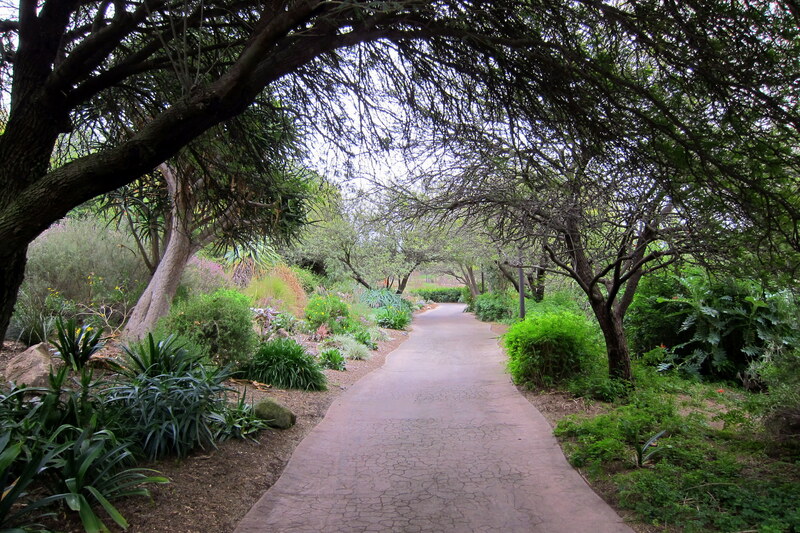 Each region is interconnected by a nice walking path bordered by native plants and trees. This place is huge! There are 1,800 acres and lots of additional land surrounding the park which is held in a perpetual conservation easement. Another feature of the Safari Park is the ability for guests to remain on the grounds after the park is closed for the day and enjoy special behind the scenes tours and nature walks. Those folks then are allowed to remain overnight in one of the cabins on the grounds. 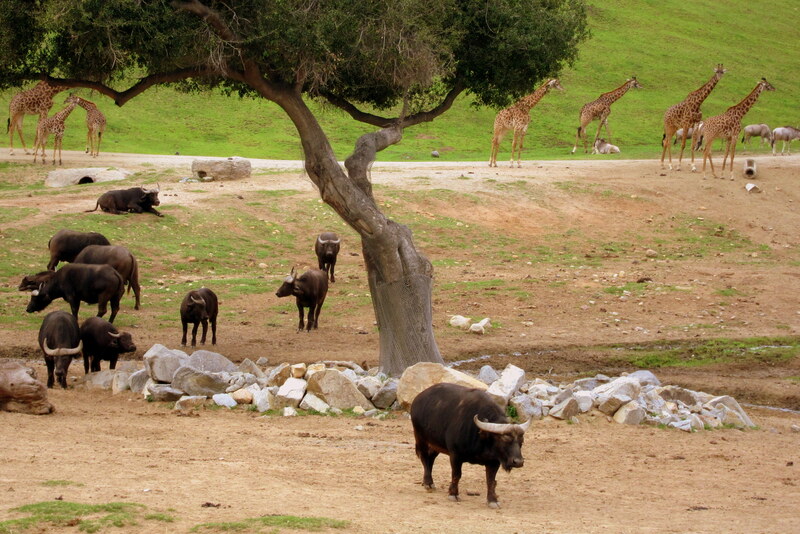 Much of the park is actually a “reverse zoo”, as the animals are relatively free to roam within their native habitats and the public is kept inside barriers. One anthropological fact that I learned is that the bizarre looking biped pictured below is known as an Americas Homo Sapiens. I believe that to be incorrect. I have it on good authority that he prefers women…..in fact, even though he is allowed to remain among his free ranging species, the male Americas Homo Sapiens is strongly influenced by the enchanting female of the species. 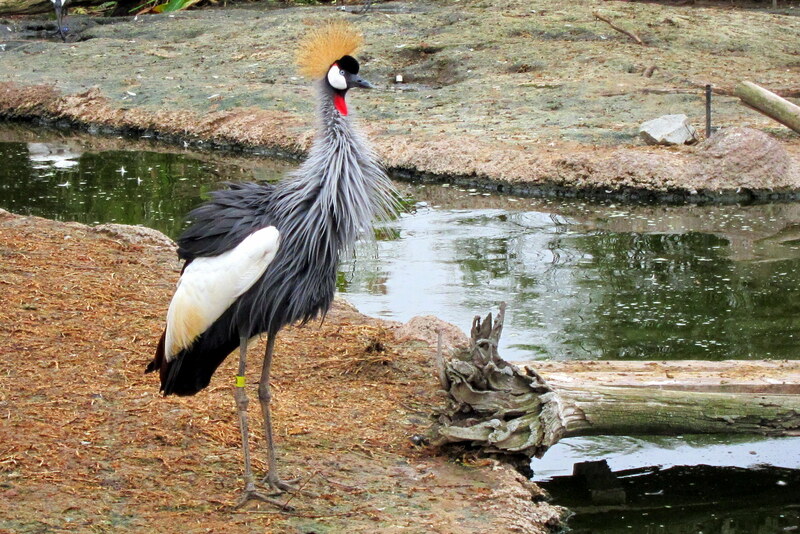 The zoo staff periodically will bring one of their charges to meet the visitor…..up close and personal. 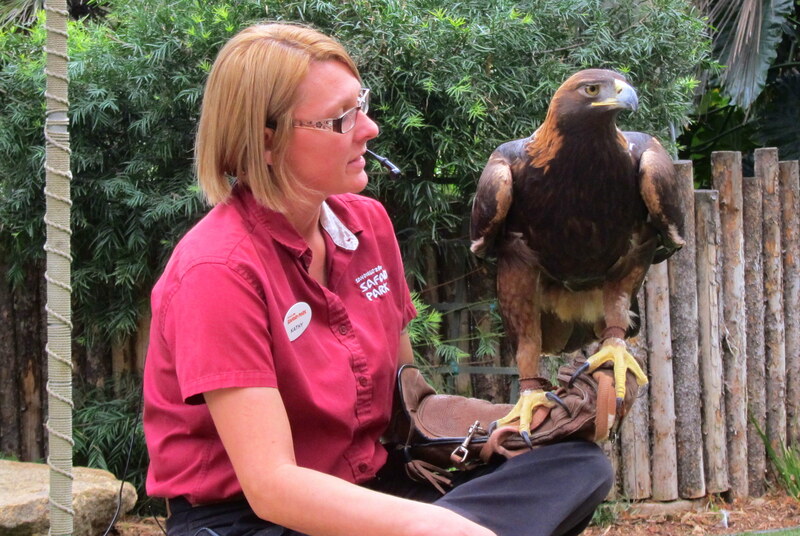 This beautiful Golden Eagle was found injured and brought to the park for rehabilitation. However after being nursed back to health, it was discovered that he could not fly so was kept at the park as an ambassador. There are a number of places to eat scattered about…..I enjoyed lunch at the Thorntree Terrace which shared space with a colony of acrobatic Lemurs. 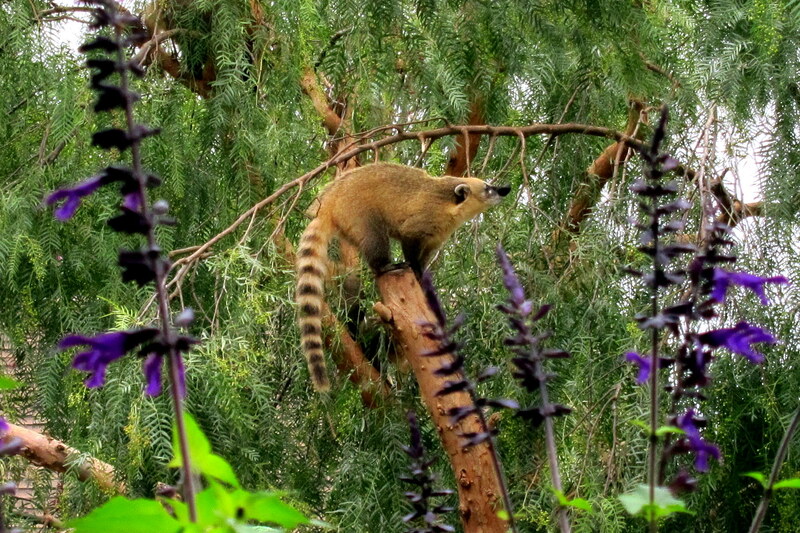 Very energetic and highly entertaining, the little critters were a blast to watch scampering about. As you might guess, the larger animals had the largest tract of land…..these elephants were a part of a much larger herd that inhabited the cleverly named Elephant Valley. 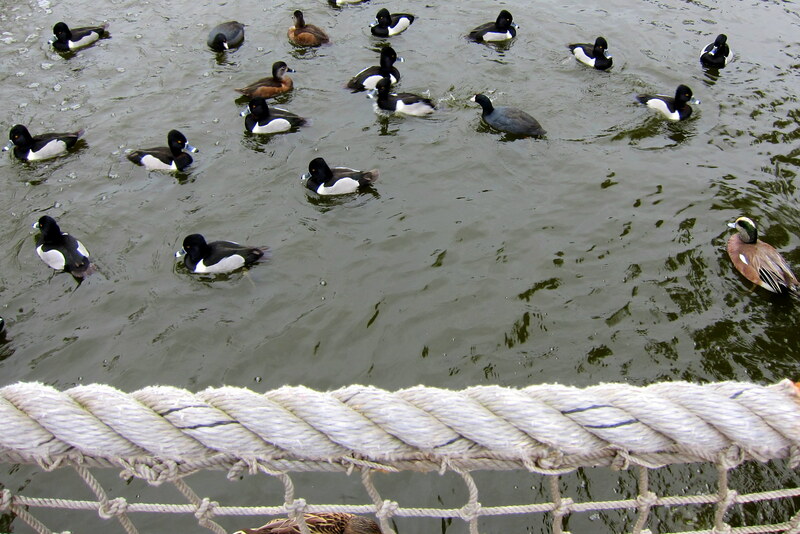 There are a number of birds in the park as well. Those that can’t fly are kept in and around the many ponds in the park. 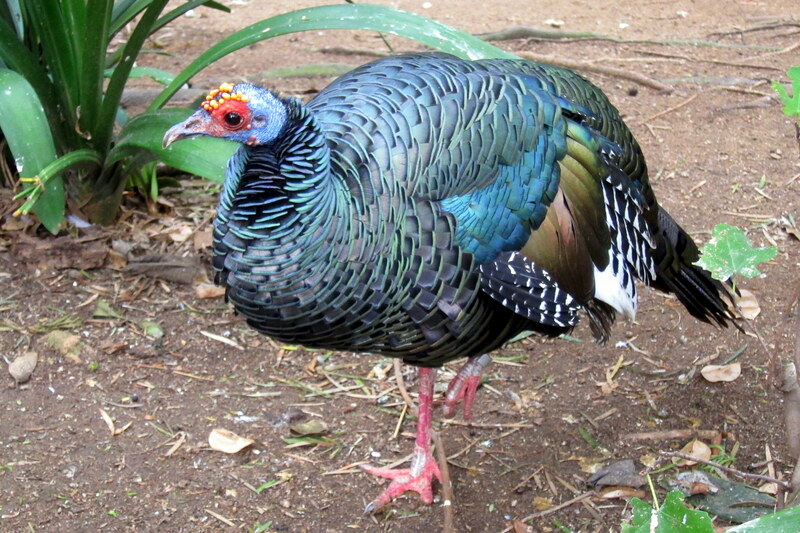 And those that can are in a large Aviary that the public can walk through via double doors. Back in the early 1970’s, while serving on a Destroyer in San Diego, the call went out from what was then called the San Pasqual Wild Animal Park for surplus mooring lines. My division was responsible for three of the six lines normally used to secure our sized warship to the pier and we donated several worn lines…..wonder if these are the same ones? 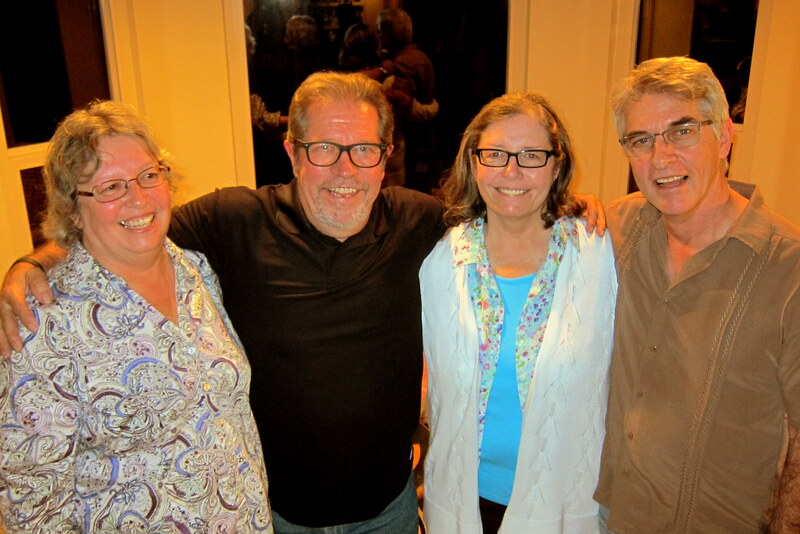 By early evening, we all reconvened at Don and Char’s place for pizza and beer…..the perfect ending to a perfect day! In order to partially repay the kindness of Kit’s brother Sam David and his family for their inviting us to backyard barbeques on successive weekends, we hosted them at our camper for a barbeque at Admiral Baker Field. By all accounts, everyone had a nice time. It was great to spend more time with them! 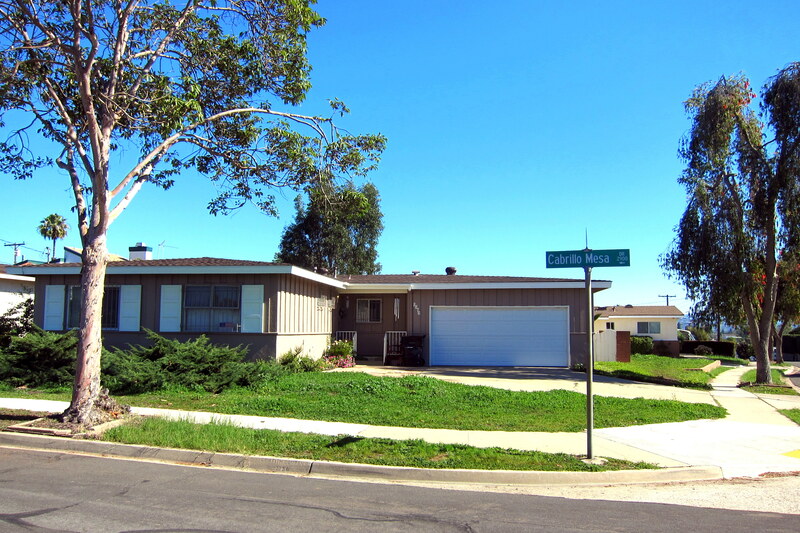 Each year, while in San Diego, we take a drive down memory lane and revisit areas that Kit and I grew up in…..well, those that we still recognize that is. Below is a photo of the home that I was raised in. OK, OK…..I know it’s technically not on “Memory Lane”. However there were many memorable things that occurred in that place! Since my single mom worked long hours, there were lots of entertaining times in that garage and behind those walls! Well, time to leave San Diego and head for our vacation camping spot on the ocean……hey, the life of a retiree is hard work……we deserve vacations too! Stay tuned for fun in the sun in the Sunbelt! Kit’s Bit’s: Bill has been so good about letting me “personalize” our new rig. Since he’s kind of a “fixit” guy, he installed a nice big magnetic white board for me to display our family pics on. Turns out, it was NOT magnetic!!! So, we found some museum putty, which they market out here as earthquake putty to use. It’s working OK, as long as the weather doesn’t get too warm. At that point, the pics slide down the board! So, we are now experimenting with double sided tape. Re-outfitting a new rig is much like moving to a new house. It takes a while to get everything in working order and conveniently stored. On a lighter note, it has been wonderful reconnecting with my brother Sam David, Anne and Chelsea! It is also great to see John and Lu, his girlfriend of many years…and, of course, spending time with Charlotte and Donald. We have spent quite a bit of time in SD this year, maybe we should think about a standing reservation at one of the RV parks… just sayin…. Love receiving these journals! Please let me know,when the ceremony for your mom is going to be, and her location. From the picture. I think I can find it….I will visit when I visit my dad and a couple of friends. 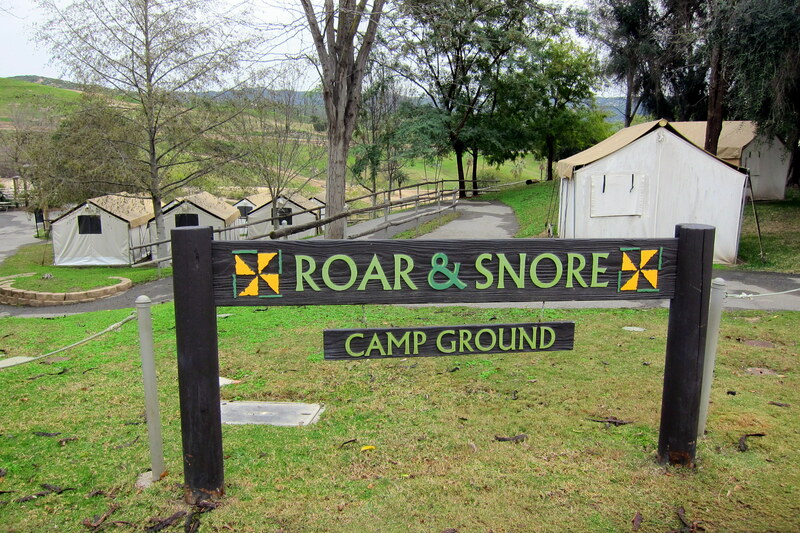 Loved the title, “Roar & Snore” Always enjoy SD sites. 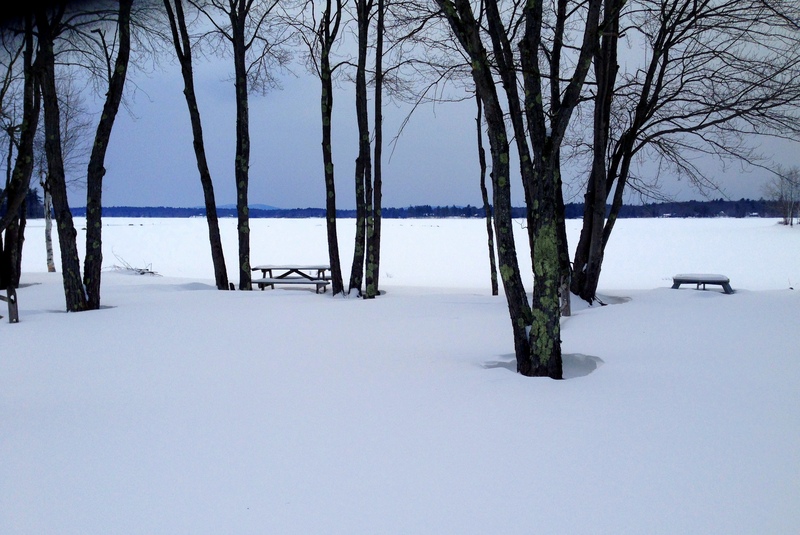 The only ones who deserve a vacation are us hardy souls enduring this Maine winter! I’M GOING TO LEAVE SNORE WITH A ROAR ALONE!!! THE PIC OF MAINE STREET BURIED IN SNOW, MISSED THE LINE THAT NIGHT WITH PEOPLE WAITING TO VISIT GELATO FIASCO. MY PLOW AND SHOVELING BILL JUST SURPASSED THE COST OF A NEW ARIENS SNOW BLOWER. We just love the fact that you include historical background about so many of the places you go and the things that you see. Makes me all the more want to follow in your footsteps! Glad you’ve had so much time to spend with your family and friends. It’s always nice to catch up with those we don’t see too often! And glad the camper is becoming “home”. 💕 you guys!! Love your story telling and pictures!